Pain pump delivery of narcotic drugs is a rather new option available to persons with cancer and non-cancer pain. 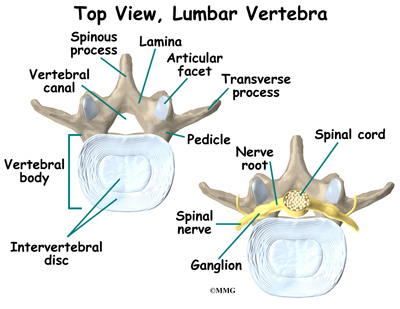 It is also called intraspinal (within the spine) or intrathecal (within the spinal canal) delivery. It was first used in 1979 after the discovery of narcotic receptors in the spinal cord. The use of an implant device to deliver medications directly in the area of the spinal cord was first used in 1981 for cancer pain. Since then, the pain pump has been used for chronic non-cancer pain such as failed low back surgery syndrome and spasticity from neurological conditions like multiple sclerosis, spinal cord injury, and cerebral palsy. 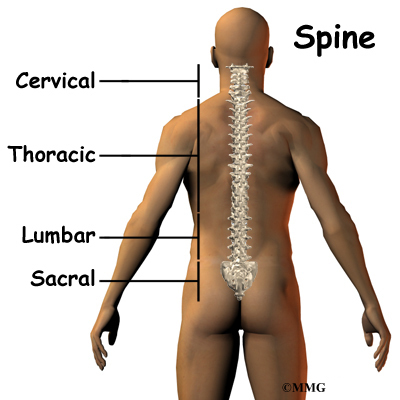 The spinal cord is a nerve tube that is housed within the bony spine. A thin, delicate membrane called the pia mater covers it. 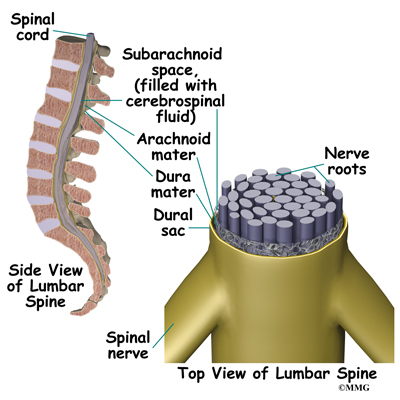 The second membrane layer surrounding the spinal cord is called the arachnoid mater. 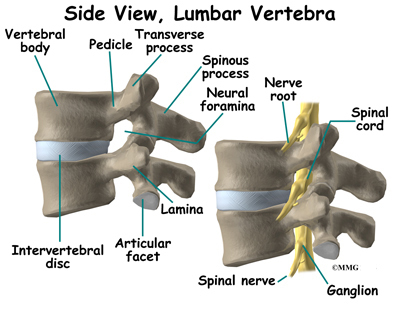 The outermost covering of the spinal cord is called the dura mater and is somewhat tough. The fluid filled space between your spinal cord and the arachnoid mater is called the subarachnoid or intrathecal space. This is where the pain pump delivers medication. It is then mixed with the cerebral spinal fluid. Cerebral spinal fluid is a clear liquid that bathes and cushions the spinal cord and brain. If the cerebral spinal fluid leaks out of this space, it can cause a headache of variable severity. The pain pump was first used in 1979 after the discovery of opiate receptors in the spinal cord. Opiate receptors are the connections on the nerve cells where medications such as morphine actually connect to the cell. These receptors are necessary for the medication to create the signals to the cell to reduce pain. Prior to 1979, no one believed that pain medications worked on the nerves of the spinal cord. We now know that much of the pain control achieved by medications such as morphine occurs in the spinal cord nerves. It makes sense that we should try to deliver the medications directly to the receptors so the medication(s) has the greatest effect. The other great benefit of the pain pump is that less medication is required to get the same effect. When you take pain pills, the medication must travel through your bloodstream in the same concentration throughout your body. This causes side effects when the medication affects different organs systems, such as the bowels, kidneys, and liver. By placing the medication directly into the spinal canal, there is less medication in the bloodstream. Less medication in the bloodsteam means fewer unwanted side effects. Talk to your surgeon about all medications you are taking before the procedure is scheduled. Do not eat or drink for at least six hours before the procedure. You will be able to take your usual medication with a small amount of water. If you have diabetes, do not take your insulin or diabetic pills until after the procedure. You will need a driver to return home. Do not take any aspirin or aspirin-containing medication at least eleven days before the procedure. They may prolong bleeding. Wear loose fitting clothing that is easy to take off and put on. Take a shower the morning of the procedure, using a bactericidal soap to reduce chances of infection. Before we discuss the surgery, lets look at the pain pump itself. The pain pump is a round metal device that your surgeon places just under the skin of your abdomen. It is about the size of a hockey puck. Inside the device there is a space called a reservoir. This holds the medication(s). Attached to the pump is a catheter or small plastic tube. The catheter is surgically placed near the spinal cord in the intrathecal space. The tubing is then tunneled under the skin and connected to the pump. 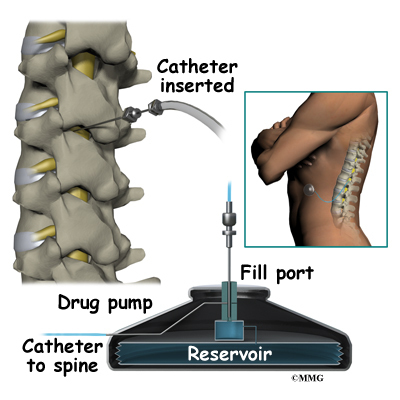 The tubing is what delivers the medication stored in the pump to the spine. The pump is programmed to dispense the medication at a certain rate throughout the day. The pump stores the information. It can be adjusted when needed. The medication lasts one to three months depending upon the amount infused. When the pump needs to be refilled with medication, a doctor or nurse inserts a needle into the top of the pump through your skin. The medication is then refilled through the needle. Chronic non-cancer pain can be complicated by physical, psychological, and behavioral factors. Candidates for pain pump undergo evaluation for untreated addiction, psychological problems, and evaluation for medical contraindications such as risk for infection. Once it is decided that you are a candidate for an intrathecal pump, you will have a trial period with medication delivery to the intrathecal space. Usually this involves placing a catheter (small plastic tubing) into the intrathecal space. It is then connected to an external pump. The trial period lasts for two to three days. Sometimes a trial period will consist of just a single or multiple injection of medication placed in the intrathecal space by a lumbar puncture. A 50 percent or greater improvement in pain (or spasticity) and function would suggest that the implanted device is reasonable to consider. The doctor then knows best where to place the tip of the catheter and what medication(s) is effective. If during this trial period the medication is not tolerated or does not provide relief, the implantable device is not considered. The implanted pump is not necessarily permanent as it can be removed at any time. Anesthesiologists, neurosurgeons, and other doctors who specialize in spine disorders implant the pump. Surgery is performed as an outpatient. It is a two-part process and usually takes three to four hours. You will have anesthesia during the procedure. Most patients are discharged to home the same day as the procedure. The catheter or small plastic tubing is inserted into the intrathecal space through a small incision near the spine and secured there. Careful placement of the catheter is important as the medication is only beneficial if placed in the area surrounding the spinal cord, the intrathecal space. Once the catheter is in place, an extension catheter is threaded under the skin around to your abdomen where the pump will be implanted. Next your surgeon makes a four to six inch incision in the side of your abdomen, below the waistline. The pump is then inserted between the skin and muscle layers. The catheter is then attached to the pump. Medication is then allowed to flow from the device through the tubing. Positioning of the catheter is checked with fluoroscopy. 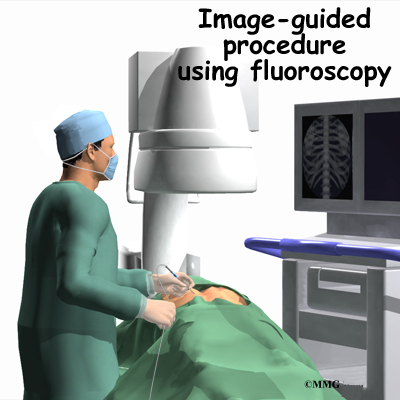 Fluoroscopy is an imaging technique using a continuous X-ray beam that is passed through the body part being examined. You are placed between the X-ray beam and a fluorescent screen. The image is transmitted to a TV-like monitor so that live video images can be played. This allows the physician to watch the procedure he/she is performing to ensure proper placement of the catheter. It also allows them to check and make sure the medication from the pump is delivered correctly. When opiates for pain relief are determined to be necessary, the most commonly used opiate in the pain pump is morphine. Another commonly used opiate is hydromorphone. There is significant amount of research and clinical experience using these medications. Other medications that can be administered by the pain pump include bupivacaine and clonidine. Sometimes one of these medications is used in combination with a narcotic. Baclofen is another medication this is safe to use in the intrathecal space and is helpful for the management of spasticity. Spasticity is the abnormal contraction of a muscle making it somewhat rigid. This causes the muscle to have difficulty relaxing. This also interferes with normal movement. As a result, spasticity can be painful. Other medications that have been studied for use in a pain pump include fentanyl, methadone, and ziconotide. Oral medications are more likely to cause side effects than intrathecal medications. 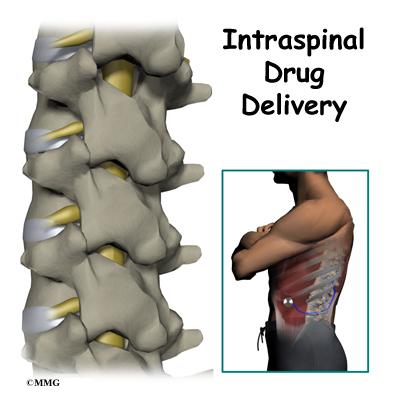 Usually the amount of medication required is significantly less when delivered directly to the spinal cord. A reduction in side effects such as sedation, nausea, and constipation should be expected. However, limb numbness, swelling of the lower legs, orthostatic hypotension (sudden drop in blood pressure), and difficulty starting urine flow (urinary retention) are the most common side effects of intrathecal medications. Most patients have a significant decrease in pain and improvement in functional abilities. You should be able decrease or discontinue oral medications altogether. If the pump is implanted because of spasticity, a reduction in spasticity should be noticeable. Implanting the intrathecal pump can have complications, the most common ones are infection, bleeding, neurological injury, and cerebral spinal fluid leaks. The use of anticoagulants such as coumadin (Warfarin), aspirin, most of the antiinflammatories, and some herbal supplements can interfere with the ability of your blood to clot. This can increase the risk of bleeding. Your surgeon will ask you to discontinue these medications several days before the procedure. Bleeding that occurs around the spinal cord is a problem as it may cause spinal cord compression and neurological damage. Emergency surgery to remove the blood may be necessary to avoid neurological damage. If not recognized or treated early, weakness of the muscles or paralysis, change in sensation, and loss of control of bowel and bladder can be permanent. Because the tubing of the pump is placed in the space around the spinal cord, an infection or bleeding could be dangerous and even life threatening. It can cause permanent nerve damage and even paralysis. Use of a pain pump is usually considered only when other therapies have failed and surgery is not an option. Infection of the surgical site needs to be identified early and treated aggressively to prevent serious complications. Most surgeons take several precautions to decrease the risk for an infection. Antibiotics are given intravenously during the surgery. Your surgeon may want to do a nasal swab to determine if you have a resistant bacterium that can be carried on your skin. Neurological injury can also be caused by catheter placement. It can be the result of inflammation that can occur at the tip of the catheter. It can cause a mass or granuloma at the tip of the catheter. Cerebral spinal leaks may cause you to have a headache and if the leaking continues, it can cause stiffness of the neck (nuchal rigidity) and even neurological damage. Although less likely, there is the risk of pump failure. If a opiate is being delivered by the pain pump, withdrawal symptoms will likely occur. Withdrawal can be caused when medication runs out, the pump malfunctions, or the tubing breaks. Withdrawal symptoms can make you feel like you have the flu. Body aches, nausea, stomach cramping, nervousness, and chills are some of the symptoms reported. There is always a risk of overdose and even death. One other potential inconvenience is that there are few professionals available to refill and adjust the pump in some areas. This may complicate your care and necessitate travel to a center that can provide this service. You will have a follow up appointment with your doctor seven to 10 days after surgery to remove sutures or staples. Adjustment in medications can be made also. You will be allowed to shower but not bathe or submerge your incisions for four weeks. Watch for visible swelling or leaking of fluid from the incisions. You should wear loose clothing over the incision sites. You will be asked to avoid bending, twisting, stretching, reaching overhead, or lifting objects over five pounds for the first six to eight weeks. This is to avoid movement of the catheter near the spinal cord. You may not be allowed to drive for two to four weeks after the procedure. Sexual activity may also be limited at first. Usually walking is advised following the procedure. Gradually you will be allowed to return to daily activities. You may be asked to see a physical therapist for formal education and exercise instruction.